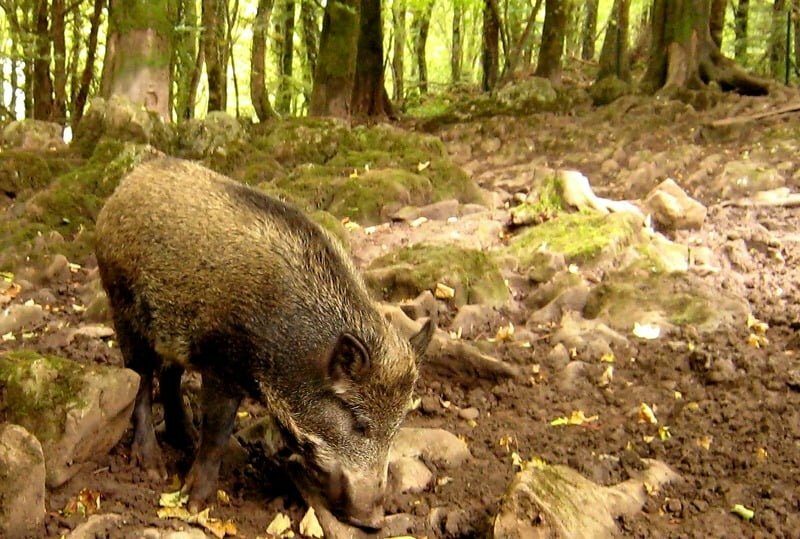 The Irish Wildlife Trust (IWT) has hit out at Invasive Species Ireland for the classification of the once native wild boar (Sus scrofa) as an official invasive species here. The move comes on the back of a number of sightings of boar around Ireland over recent years – most recently the case of a large boar shot in the Slieve Bloom Mountains. While the Trust acknowledges that the boar spotted in the wild in Ireland today have almost certainly been introduced illegally, possibly for hunting, they question the classification of a once native animal as invasive. According to the ISI website the Wild Boar is classified as invasive and is listed as one of Ireland’s “Most Unwanted”, and are “known to damage crops, gardens, amenity areas as well as potentially spreading disease”. But the IWT argues that this once native species is a “keystone” of the forest ecosystems. Boars forage by rooting up the forest floor, establishing a disturbance regime that encourages plant biodiversity and facilitates natural regenaration. The IWT opposes the illegal release of wild boar, and suggests that any reintroduction should be conducted through cooperation with the National Parks and Wildlife Service, delivered in accordance with IUCN reintroduction guidelines backed up by solid science. It is calling for a study firstly to confirm if there is an established breeding population of boar in Ireland, and then to assess the animals’ genetic purity, geographical origin, potential as a vector for disease and the availability of suitable habitat. “If it is found that that animals are relatively pure, of appropriate genetic stock for Ireland and disease free, then an assessment should be made as to whether they should be allowed to remain, through consultation with interested stakeholders,” said the Trust. What do you think… should Wild Boar be officially taken off the invasive species list and a “proper” reintroduction programme started? Let us know in the comments. of course its not an invasive species, time does not change the fact that its native. Wild boar are already being introduced back into England and Scotland.